Fair to say I had that empty feeling as I woke up on Monday morning knowing there was no more Arsenal for a few months; but in a way, I was glad. I think we all need a holiday and a break from football. Supporters, players and manager and even the stewards look a bit worn out! This has to be one of the more frustrating seasons in recent years because of the dramatic fall from four competitions to one then to none. The Emirates was a strange place in the latter part of the season, it was very uneasy and very tense and with the results on the pitch, no one can be surprised. Fulham away on Sunday pretty much summed up the last few months. Robin Van Persie scores AGAIN and some school boy defending meant we conceded two goals. The best thing about Sunday was the atmosphere in the away section at the cottage and once again it was superb. Chants such as ‘your statue is S***, your statue is s***, it should have been Jedward, your statue is s***’ was a highlight. The other chant that created a story was about spending money. I didn’t get involved in the chant BUT completely understand it. This squad does need some work and some investment and for many supporters who like me, paid £50 to come and watch the Arsenal on Sunday just wanted to get their message across. 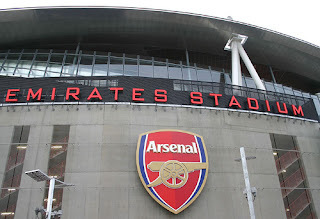 What was touching was that straight after that chant, there was a chorus of ‘We Love You Arsenal’ for about a good five minutes and that just showed that supporters are frustrated BUT are still very much in love with the club and only want the club to be successful. After the game Mr Wenger said we cannot spend 50m on a player and off course the supporters were not hinting that we do but I do believe Mr Wenger knows exactly what the supporters mean but wanted to fob the question off a bit because he has always been quite tight lipped about transfer activities. In an interview with Arsenal Tv (Arsenals own media channel) he was more open and said he will be active so I guess we just have to wait and see. 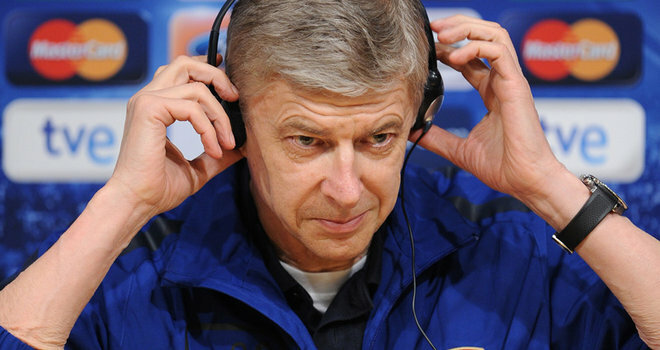 With players like Denilson and Bendtner indicating they may leave and with others rumoured to want to leave, the boss has no real choice but to strengthen. In a press conference a few weeks ago, he was asked about conceding late goals and he put it down to experience and said the transfer window is a way of solving it. For me, it’s not about how much we spend; it’s more about the off course the quality but personality of the player. Take someone like Martin Keown, he perhaps was not the most technically gifted footballer we have had BUT he was a warier and a leader and stood up to be counted for ALWAYS. I think it may be time to look at a players personality as much as their playing quality because we do lack leaders. The right balance has to be found. You get the feeling this is a HUGE summer for the Arsenal but one thing that we wanted was Jack Wilshere to get a rest and we got that, so wanting a few experience players may follow! Come on You Arsenal ! Ps. My favourite moment of the season is always at the cottage because when the second half is starting, Mr Wenger always forgets to come out ON TIME rather then his usual 30 seconds into second half but at the cottage, the tunnel is on the other side of the dugout and you have to go right through the pitch and EVERY year Mr Wenger makes the same mistake and is told to run and seeing our beloved Frenchman in a suit running is always a sight that makes me smile! Another season at the Emirates comes to a close and it is a similar story. It was bitterly disappointed how flat we were against Aston Villa and it was sometimes painful to watch. A season of ‘what ifs’ dominated life at the Emirates this season and questions will be asked again. I think it’s a bit of a under statement to say we were a bit flat yesterday and the game was very much that sort of end of season game. A win was vital if we want to go straight into the group stages of the Champions League but now we have to rely on other results. One thing interesting that happened yesterday was that I met Laurent Blanc (French National manager plus World Cup winner) and he was happy to answer a few questions we had for him. I was keen to ask him about Mamadou Sakho and how he rates him because Arsenal have been linked to him for a while. Blanc said that he is very strong physically and very strong mentally. I asked him if thinks he may become an Arsenal player in the future and Blanc thinks he might. I was keen to ask him about our Arsenal lads and in particular Samir Nasri. Blanc thinks Nasri has a lot of potential but is not there yet. That got me thinking about Nasri playing in the Cesc role if Cesc goes this summer and I had never really been convinced and listening to Blanc has made me see that Nasri will get even better and it really is vital to keep both Nasri and Cesc as one can learn from the other. A player I think that has had a good season and will be a star for this club is Laurent Koscielny and as Arsene Wenger said the plan was only to play for him for about 20-25 games this season but he was ‘thrown in at the deep end’ and Blanc thinks he can be a real player and just needs to develop and get stronger and he will get there. Laurent Blanc saw me turn to the Jack Wilshere page on my program and instantly pointed and told me how good Jack Wilshere is and thinks his vital to any future Arsenal and England have. 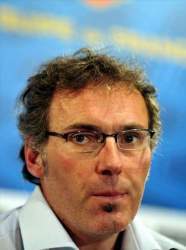 As you can imagine, talking to Laurent Blanc was probably one of the more interesting parts of my day and it was quite amazing talking to an international manager and Blanc was a very intelligent man. He was a world cup winner too and I was keen to see what he thought about players he played with and he said that Ronaldo was the best player he ever played with followed by Zidane. He really rated Manu Petit too. He also thinks Arsene Wenger is the right man as he complimented my In Wenger We Trust t-shirt. 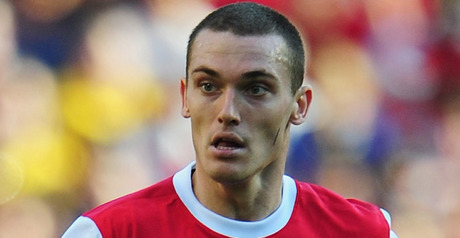 Thomas Vermaelen may make his long awaited return to the Arsenal side this Sunday and how badly has he been missed? Thomas Vermaelen reputation seems even better over the last eight months even thought he has not played BUT will need time to get back into the groove as they say. Vermaelen had a superb first season and scored some important goals in important matches and his return is welcomed. To have him fit and playing a few games before the summer is a massive boast and with a good pre-season, we hope he will be fit and firing next season. Arsene Wenger conceded that Koscielny and Djourou have played more games then they were scheduled too and only had about 20 games planned for Laurent Koscielny. It has meant that Koscielny and Djourou have had the chance to ‘mature’ according to Arsene Wenger but the plan was clearly not to play them all season long. Arsenal have certainly fallen short this season in terms of crossing that finishing line but have played some top football a long the way. Newcastle away in the first half (obviously), Birmingham on new years day, Chelsea at home, Barcelona in the last 15 minutes and Manchester United a few weeks ago are just some examples. When quizzed on why this has happened and if the transfer window can help solve it, Arsene Wenger said that it’s about experience and therefore the transfer window can help. There has also been some tweets flying around about Cesc Fabregas. Tweeters have said that this could be his last game at the Emirates and even though it well may be, I prefer not to think about that and just win the game and hopefully Cesc will play and play well and off course I hope he is here for years to come because he is a world class player. Not much else to say apart from lets win on Sunday! Finally we got a victory over Manchester United. Even though the title race may be all but over; it was still sweet. It was a special day and moment for Aaron Ramsey who scored the winner and after the last year or so he has had and who would take that moment away from him. I heard a few people say on my exit from the stadium about whether we still need Cesc Fabregas and my opinion is WE CERTAINLY DO. He may not have had the best of season however he is still one of the best players in the world. Keeping the squad together (maybe get rid of some deadwood) and adding a few players is more the way to go. I think the last three games are just about getting nine points and ending the season strongly and Stoke away for a number of reasons will be important. It will be a big day for Aaron Ramsey and I make the bold prediction that the one Aaron Ramsey chant may be sounding around just like the Eduardo one did at St Andrews the year he returned there. So roll on Stoke away and roll one another three points.